Staff member Nikki with the Post Office’s bright gift counter. Card of the day seen at the front of the till is BB’s ‘Have a fabulous day’ card. The humble Post Office is no longer simply a place to stock up on stamps, buy parcel paper, or perhaps apply for your passport. As technology advances in recent decades have meant that we can easily skip a trip to the Post Office, this proud British institution has had no choice but to evolve. And the BB crew are proud to be playing a small part in the modernisation of one well-loved Post Office in Milton Keynes. The Post Office on Newport Pagnell High Street, conveniently located just six miles from BB HQ, has recently welcomed new owner Bal, a true veteran of the postal service with 28 years under his belt. Bal and his team are determined to shake up the traditional Post Office by transforming and lifting the quality of items on offer. One way that many Post Offices have always dealt with changing customer behaviour and needs is by offering additional items, such as stationary or sweets. With Newport Pagnell’s busy Post Office, Bal recognised the local need for more modernised services and introduced new tech, including a printing booth and special photo booth dedicated to DVLA and passport formats, as well as a cash machine. But Bal and co did not stop at new technology: they also introduced a new, modern strategy focused on introducing high-quality local arts products for sale. And so this is where Barley Bay come in. BB are lucky enough to have launched two greeting cards spinners here, showcasing our extensive range of designs. Our cards have certainly proved a hit with the locals so far – originally starting with one spinner containing 72 designs, these proved to be so popular that two weeks later we were asked to restock and fill a second spinner of 48 more designs! The prints of our textile work are so convincing, says Bal, that he watches customers pick up the cards and run their hands over them to feel for the texture. Over time, we are eager to see which of our designs prove to be the most popular with the locals of Newport Pagnell! 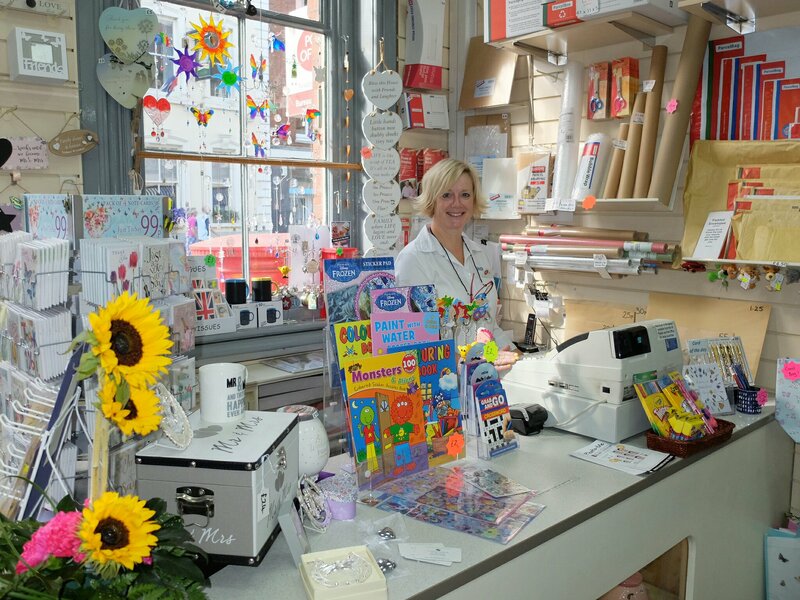 BB also supplies greeting cards to the Spots Post Office in Southwold, which was a RETAS winner this year. Do you manage a Post Office and are looking to diversity your product offering with high quality artistic greetings cards? If so then take a peek at our extensive range on the BB website. And if you fancy chatting to us about your retail strategy then we are all ears! Myra with one of the BB spinners.